Your Programs, Files and Settings! Automatically move the currently logged in user, local accounts only; as well as all selected applications, files, and folders to your new PC. move to a new PC! 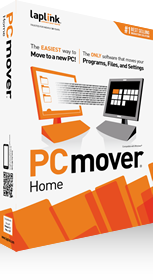 PCmover Home is the easiest way to move to a new PC without leaving anything behind, even when there are different versions of Windows on the old and new PC. Nothing is changed on the old PC and nothing is overwritten on the new PC. Install Simply install PCmover Ultimate software on both your old then follow the step-by-step wizard to get started. Click through the easy-to-use wizard to select which programs, files, and settings to transfer to your new PC. Your new computer has the same personality and functionality as your old PC. No need to reinstall programs because PCmover did it for you. Multiple Hard Drives Not Supported. PCmover Home will only transfer data from the C: drive on the old computer to the C: drive on the new computer. Other hard drives (e.g., E:) will be excluded from the transfer. Please note that PCmover Home serial numbers are unique to PCmover Home and will not work with other editions of PCmover.